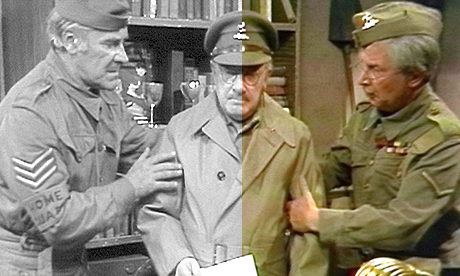 On Saturday 13th December 2008, BBC2 transmitted an edition of "Dad's Army" which up to now has only existed as a black and white film recording. The episode from 1969 entitled "Room at the Bottom" has had its colour reconstituted using software which unscrambles the PAL dot pattern present on the monochrome transmission - the process has been described as "akin to turning an omelette back into an egg". This decoding technique will also be applied to episode three of "Planet of the Daleks" featured on the next Doctor Who DVD release "Dalek War" which also existed only as a black and white telerecording. More details of the work carried out by the Colour Recovery Working Group can be found here.